♣ What is Prayers (Salat)? ​It is the duty of every Muslim to pray five times a day. Prayers are intended to focus the mind on Allah, and is seen as a personal communication with Him that expresses gratitude and worship. According to Islam, if a person offers the prayers, she will get merits and blessings of Allah Almighty, on the other hand, if she misses the prayers, she will get sins which will lead for the divine punishment. ♣ ​​When prayers become compulsory for a girl? ​♣ To whom prayers are not compulsory? ​♣ Does a woman who newly embraced Islam require to redo the prayers which she missed before accepting Islam? No, ​once a non-Muslim​ woman embraces Islam, she does not need to redo the prayers which she did not perform at her time of being a non-Muslim. Once she accepts Islam, all her previous sins will be forgiven. But she will be obliged to pray from the time of she accepted Islam. ♣ Does ​a woman require to redo (Qadaa) the salaah which she missed due to bleeding from menstrual flow or child birth? No, she does not require to redo ​them. When a woman leads the congregational prayers ​​to other women, she should not stand alone in the front as men do. But she should stand in the middle of the first row. In Islam, it is not forbidden for women going to mosque for the prayers. 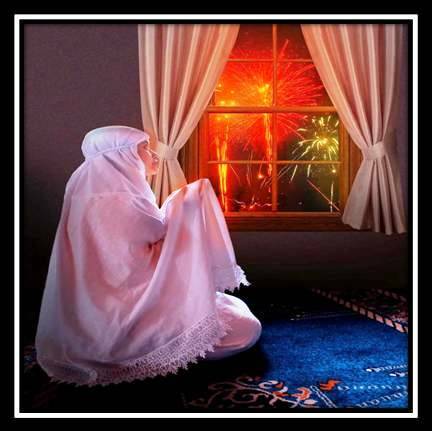 ​But beloved Prophet sallallahu alaihiwasallam preferred that women to pray at home. Prophet ﷺ said: "Do not prevent your women from going to the mosque, even though their houses are better for them." It is a duty of every Muslimah to obey what Allah and his beloved Prophet ﷺ preferred and ordered. So women should pray at their home rather going to mosque. Fard prayers are the compulsory prayers every Muslims must perform five times a day. If she performs them, she will get the rewards and love of Allah. If she does not perform them, then ​she will get sins which will lead for the divine punishment. Sunnat prayers are the additional optional prayers which are practiced by beloved Prophet sallallahu alaihiwasallam, but not imposed as compulsory to his nation. ​So if a woman performs them, she will get extra rewards and love of Allah and beloved Prophet sallallahu alaihiwasallam. Also these optional prayers would compensate any errors or mistakes exist in our compulsory prayers. ♣​​ How many times a Muslimah should pray and what are those Fard prayers? ♣ What is the awrat for women to cover during the salaah? Women should ​​​cover all the body except the face and hand up to the wrists. Should not wear the transparent material which shows the body. ​​♣ How to perform wudu (Ablution)? It is compulsory to do wudu before praying salah. ​In wudu some are fard and some are sunnat. Fard are compulsory and sunnat will give additional rewards. Here we have listed out the proper and complete method of wudu. ​Once wudu is completed as mentioned above, recite this dua facing the qibla. ​​"Ussalli Fardal Subuhi Rak'ataini lillahi Taa’la Allahu Akbar"
​If you do not know how to keep intention in Arabic, you can intend in English. ​​"Ussalli Sunnatta Subuhi Rak'ataini lillahi Taa’la Allahu Akbar"
​"I intend to pray two rak'at of Fajr sunnat prayer for Allahu Taa'la"
♦ Now recite any surah from al Quran. But this second ​surah has to be recited only in first and second rak'at. It should not be recited in third or fourth rak'at. In third and fourth rak'at only surah fatiha has to be recited. Trans: ​"O our Lord, and all praise is to you"
​​​♦ Now say "Allahu Akbar" and go to Sajdah (prostration) again and recite same as you did in the previous sajdah. "Allahumma salli alaa Sayyidina Muhammadin wa alaa aalihi Sayyidina Muhammadin, kamaa sallaita alaa ibrahima, wa alaa aalihi ibrahim. Wa barik alaa Sayyidina Muhammadin​​ wa alaa aalihi Sayyidina Muhammadin, kamaa baarakta alaa Ibrahima, wa alaa aalihi ibrahim. Innakka hameedum majeedh. ♦ Once you finished reciting this above salawat, finish your prayer by saying salaam. ​Turn your head to the right and say, "As Salamu Alaykum wa Rahmatullah"
Once you finish your salat, say "Astaghfirullah"​ three times. ​Then say "SubhanAllah" - 33 times, "Alhamdulillah" - 33 times, and "Allahu Akbar" - 34 times. Also if you recite Ayat al​ Kursi after every prayers, it will help to enter paradise easily once you died.